Pierre-Emerick Aubameyang was dropped for the club’s draws with Wolfsburg last Sunday and at Hertha Berlin on Friday. 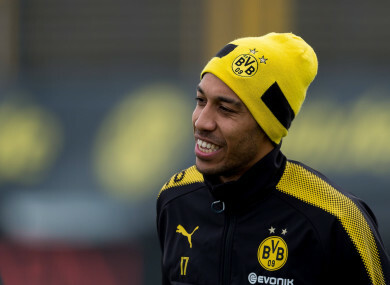 Pierre-Emerick Aubameyang pictured during Borussia Dortmund training. ARSENAL HAVE REPORTEDLY had a first offer of €50 million for Pierre-Emerick Aubameyang rejected by his German club Borussia Dortmund, according to Kicker magazine on Saturday. Aubameyang, last season’s top scorer in the German league with 31 goals, has been dropped by Dortmund for the last two games amid speculation he is chasing a move to the Premier League club. Arsenal are reportedly on the verge of selling Chile striker Alexis Sanchez to Manchester United. Dortmund will not accept less than €60 million for Gabon hot-shot Aubameyang, who is under contract with Borussia until 2021, reports say. Dortmund CEO Hans-Joachim Watzke confirmed to SID, an AFP subsidiary, that there has now been contact with Arsenal, but said reports of a possible fee are “speculation” and “the first contact has not been about money”. Aubameyang was dropped for Dortmund’s draws with Wolfsburg last Sunday and at Hertha Berlin on Friday after failing to attend a team meeting, and the club say he has lacked “focus” in training. His father, also his agent, was said to be in London this week to try to push through a transfer to Arsenal. Aubameyang trained hard alongside Dortmund’s reserves for an hour on Saturday. His tempo was noticeably higher than it had been having been dropped by Stoeger for Friday’s draw after the head coach thought the striker had been distracted in the final session before the Bundesliga match in Berlin. On Friday, while his club was drawing in Berlin, Aubameyang played a kick-about game indoors with his friends in Dortmund. German daily Bild report that he wore a Dortmund shirt bearing the name of Ousmane Dembele, who transferred to Barcelona in August after going on strike to force the German club to sell him for €105 million. Before the draw in Berlin, Dortmund’s director of sport Michael Zorc said Aubameyang was still in the club’s future plans, providing he changed his behaviour. “There’s a way back into the team for him, but professionalism is part of that, which includes saying you’ve made a mistake in one situation or another,” added Zorc. Email “Arsenal offer €50 million for Dortmund star - report”. Feedback on “Arsenal offer €50 million for Dortmund star - report”.